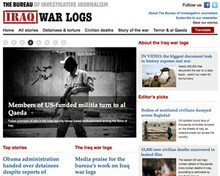 WikiLeaks expanded its media collaborations for the release of the Iraq War Logs in order to maximise the exposure of the documents' contents for the sources behind the leaks. Almost 400,000 military documents were released to media outlets across the world in what WikiLeaks is claiming to be the biggest leak of military documents in history. According to WikiLeaks, the 391,832 reports document the war and occupation in Iraq from 1 January 2004 to 31 December 2009, excluding the months of May 2004 and March 2009, "as told by soldiers in the United States Army". "Each is a 'SIGACT' or Significant Action in the war. They detail events as seen and heard by the US military troops on the ground in Iraq and are the first real glimpse into the secret history of the war that the United States government has been privy to throughout." Kristinn Hrafnsson, spokesman for the whistleblowing website, seen in interview in this video at the Frontline Club, said WikiLeaks worked with the Bureau of Investigative Journalism to ensure maximum coverage. "We thought and believed that we should expand this group to include more media in this process," he said. "Through the Bureau of Investigative Journalism we have achieved that. This is all in line with the promise made to sources to maximise the impact of the material that they leak to WikiLeaks. "It is unique in journalistic history, I think, to have so many media outlets working on the same material at the same time. The media outlets are not used to these kinds of projects, they are not used to cooperating on a basis such as this one. We relied pretty much on the expertise and skill that was provided by the news outlets. There were probably 40 or 50 professional journalists working on the material and with researchers and additional people there were probably up to 100 people." For the last three months the Bureau of Investigative Journalism, along with a group of media outlets and the Iraq Body Count agency, has had access to the documents. Following the publication of the Afghanistan war logs by WikiLeaks in July, the organisation again partnered with the Guardian, the New York Times and Germany's Der Spiegel, but this time also worked with the Bureau to open up the material to other outlets. According to the Bureau's website France's Le Monde was also given access to the reports. The Bureau also partnered with Channel 4 Dispatches and Al Jazeera English to produce films on the content and said Sweden's SVT were also "involved". Speaking in this video the Bureau of Investigative Journalism's editor Iain Overton discusses how he became involved in working with WikiLeaks and the production of its own website dedicated to the release, iraqwarlogs.com. "Julian [Assange] revealed to me that there was this enormous amount of data coming out. At the time it was coming out quite quickly, I think we had about four or five weeks to do it. We both agreed that it was probably useful to try and get as many broadcasters in as possible. The broadcaster and print worlds operate at a slightly different pace... but we thought let's have a stab at this," he says. "This is the largest media enterprise in history in terms of mining a data source and going at the same time. It has been fraught at occasion. There have been vicious journalists trying to spin stories about this that were untrue; there have been lies in the press about this. That is one part that I have had to deal with as an editor. The other part is this insistence, and necessarily so, of editorial independence. The Bureau has been working editorially independently from WikiLeaks. We are collaborating but we are editorially independent." The Bureau has set up a dedicated website to cover stories from within the war logs, as well as making films, including a documentary for Dispatches on Channel 4 that airs tonight at 8pm and shorter reports for Al Jazeera English and Arabic. The media partnerships appeared to hit some issues late on Friday when WikiLeaks Twitter account reported that it had to bring forward its Iraq War Logs embargo on news outlets after it was breached by Al Jazeera by 30 minutes. "The reports detail 109,032 deaths in Iraq, comprised of 66,081 'civilians'; 23,984 'enemy' (those labeled as insurgents); 15,196 'host nation' (Iraqi government forces) and 3,771 'friendly' (coalition forces)," says WikiLeaks on its website. "The majority of the deaths (66,000, over 60 per cent) of these are civilian deaths.That is 31 civilians dying every day during the six-year period. For comparison, the 'Afghan War Diaries', previously released by WikiLeaks, covering the same period, detail the deaths of some 20,000 people. Iraq during the same period, was five times as lethal with equivalent population size." The Bureau of Investigative Journalism said it sent two letters to the Department of Defense Press Office at the Pentagon offering it a chance to respond to a series of allegations about US forces and US defence policy. In its response the US Department of Defense says the reports do not tell "the whole story". "We strongly condemn the unauthorised disclosure of classified information and will not comment on these leaked documents other than to note that 'significant activities' reports are initial, raw observations by tactical units," it says. "They are essentially snapshots of events, both tragic and mundane, and do not tell the whole story. That said, the period covered by these reports has been well-chronicled in news stories, books and films and the release of these field reports does not bring new understanding to Iraq's past. In order to protect those mentioned in the reports the Bureau said it removed all names and detailed grid references from the documents published on its site.